Last weekend my dad was traveling in our neck of the woods on business and we were so blessed to have him stay with us for a couple of days. When family comes into town, I completely lose my senses in the kitchen. I love to serve up yummy comfort food (with a side of veggies, which are optional, of course! ), and a tasty beverage to top it off. My mom is an amazing cook, and taught me and my sister the secrets of great baking when we were young. In my kitchen, nothing is more fun than making my loved ones their favorite treats and seeing them enjoy every bite. For my dad, nothing is better than a cool slice of coconut creme pie. This is my all time favorite recipe! Don't go and buy the store bought kind! This recipe is simple and turns out golden and flaky every time! Sift together flour and salt in a large bowl. Cut in Crisco. Blend with pastry blender or fork until mixture has the texture of coarse crumbs. Sprinkle water evenly over flour mixture, one tablespoon at a time, and blend until ingredients are moist and the dough can be shaped into a ball. Divide dough into two equal portions. Shape into flattened disks. The dough can then be wrapped in plastic wrap and refrigerated until ready to use, or rolled out for a double crust pie, or two single crust pies immediately. For this single crust pie, roll out dough on a lightly floured surface until it is 1/8" thick. Be sure to flour your rolling pin and hands, too! Lay dough evenly across the pie plate, cutting off any excess and crimp edges. Poke with tines of a fork across bottom and sides (make lots of pokes!) and bake for 20 - 25 minutes in a pre-heated oven at 425 degrees, until crust is golden brown. Combine sugar, cornstarch, and salt in a heavy saucepan: stir well. Combine egg yolks and milk; gradually stir into sugar mixture. Cook over medium heat, stirring constantly, until mixture thickens and boils. Boil 1 minute, stirring constantly. Remove from heat; stir in butter, vanilla and coconut. Immediately pour into your beautiful pastry shell. Cover filling with wax paper. Let cool for 30 minutes; then chill in fridge until firm. Spread evenly on a baking sheet and place in a 250 degree oven and stir every 1-2 minutes until toasted golden. Beat whipping cream until foamy, then gradually add the powdered sugar. Continue to beat until soft peaks form. Spread whipped cream over the chilled pie filling and sprinkle with toasted coconut. Return to refrigerator to chill until ready to serve. Thank you, Melissa! Thanks for stopping by! 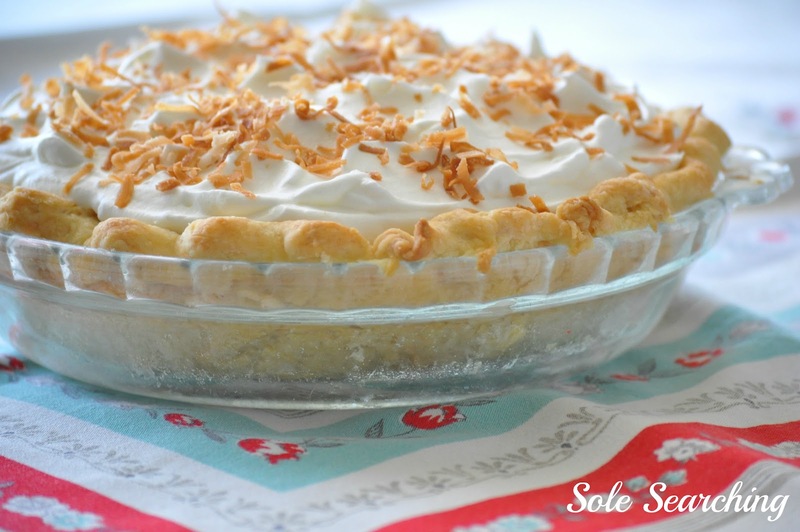 Coconut cream pie is my husband's favorite also! Although we always make it with heaping meringue one top.